Facebook's Great Unbundling isn't stopping anytime soon. And the latest little birdie pushed from the nest is none other than Groups. Because someone somewhere has to want a standalone Groups app somewhere. Probably? The good thing here, though, is that unlike Messenger (for iOS, at least), Groups is at least not disappearing from the Faceobook app entirely. Which means you won't be forced to download the app if you ever want to use Groups on your phone ever again. 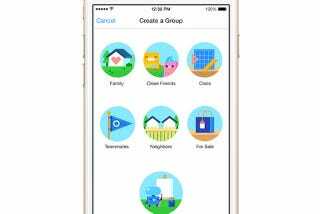 The Groups app—which, as the name would suggests, consists entirely of Groups and nothing else—does seem now like a plainer, less functional version of another of Facebook's recent onslaught of apps, Rooms. And considering that most people probably haven't regularly used any of their Groups since 2011, spinning the feature off into its very own app seems like an odd choice. Has Trump Seen Jared Naked?